Discussion in 'other software & services' started by Kyle_Katarn, Aug 8, 2008. Hello , congratulations Kyle Katarn !!! 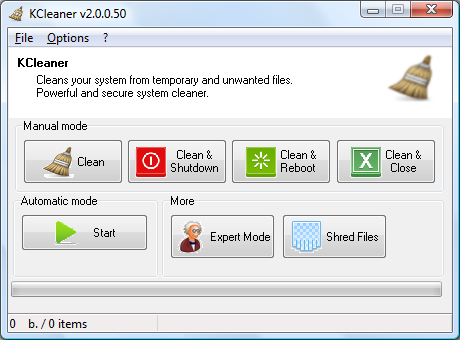 KCleaner v0.1.0.6 : 2.06 MB on HD . Options : Expert mode & Settings . Settings : English / French ; Load at startup ; Automatic mode ( Activate on start ; Frequency 1-24 hours ) . Cleaning of my PC : 18.3 MB / 43 items - mostly including 24 Windows Installer Duplicates ( = MST files Sun/Java ) . Analysis complete . Analysis during 1 sec ! Cleaning during 1 sec ! Extra complete , extra easy ! Nice GUI-fast and seemingly efficient,well done-but may I suggest, if still possible,that you add an option ,so the user can select which file category to delete. To select which files to keep can only be done individually at present. For example,I may not wish to delete cookies or temp. internet files on an ongoing basis. Hi Kyle, Great that now can select which files to delete,your a ferari speedy coder,thanks. Yes Ferari will benefit a few but KCleaner will benefit the masses ! just tested beta two portable version. Does it need a restart during installation? (If not, I can test it while in Shadow mode -- which I muc prefer when trying betas). Secundo that,its fast and find more then the others what more do you want ! i also like the automatic feature. Is this safe enough for a novice (like me) to use? This app looks like a potential winner! Since you created such a fantastic app as Sumo, I believe I'll give KCleaner a try -- with Returnil on! Kyle, I like this cleaner ALOT and eventually it's probably gonna be a keeper, but I've encountered a few problems. On the first run KCleaner stopped analysing but didn't offer me a clean. Then on a second run I got some access and violation errors. Third run KCleaner flagged some off my FD-ISR files as temporary internet files. Now on the last run a great proportion of the contents is flagged as temporary internet files my data, other accounts...I eventually had to teminate the run. Automatic option is welcomed Freeware and prompt fixes what more could you ask for. Weird Met none of these problems,also have FDISR installed,works as expected. Sofar the best cleaner IMHO. Thank you for these comments ! C / Documents and Settings / my name / Local Settings / Temp / History / History.IE5 / index.dat . Could you erase them please , thank you in advance !! !